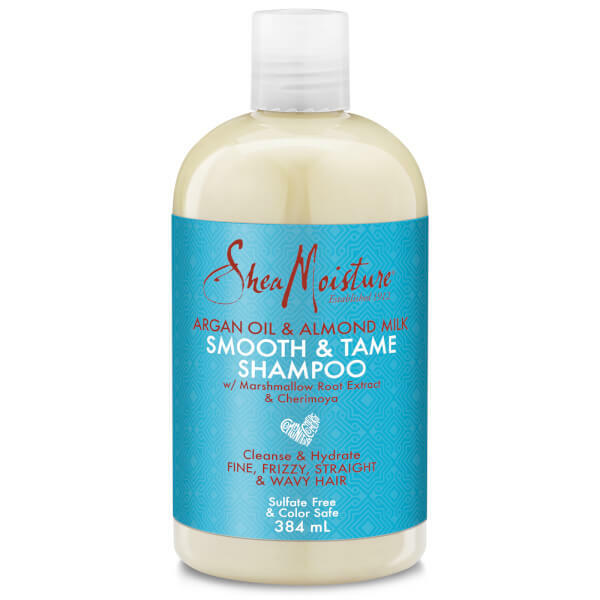 Combat frizz and flyaways with Shea Moisture's Argan Oil and Almond Milk Shampoo; a lightweight formula that works to cleanse, rejuvenate and improve manageability. 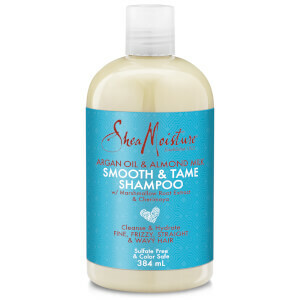 Harnessing the powers of Organic Shea Butter, Argan Oil and Almond Milk, the shampoo gently refreshes hair as it softens and smoothens to reveal sleek, healthy-looking strands from root to tip. Its dose of Marshmallow Root Extract tames and controls frizzy, straight and wavy locks for a salon-worthy finish. Apply to wet hair and gently work into a rich lather. Rinse thoroughly. Repeat as needed. Water, Decyl Glucoside, Cocamidopropyl Betaine, Sodium Lauroyl Lactylate, Sodium Cocoyl lsethionate, Glycol Distearate, Sodium Methyl Cocoyl Taurate, Glycerin (Vegetable), Argania Spinosa Kernel Oil, Cetrimonium Chloride, Butyrospermum Parkii (Shea) Butter*†, Theobroma Cacao (Cocoa) Seed Butter, Prunus Amygdalus Dulcis Fruit Extract, Prunus Amygdalus Dulcis (Sweet Almond) Oil, Annona Cherimola Fruit Extract, Althaea Officinalis Root Extract, Panthenol, Hydrolyzed Pea Protein, Hydrolyzed Rice Protein, Glycerin, Zea Mays Starch, Citric Acid, Guar Hydroxypropyltrimonium Chloride, Fragrance (Essential Oil Blend), Caprylhydroxamic Acid, Caprylyl Glycol, Sodium Benzoate. *Certified Organic Ingredient. †Fair Trade Ingredient.